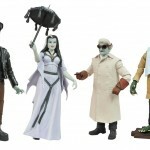 Art Asylum has posted new pics and info for the Munsters Select Series 3 Action Figures. Series 3 will depict the characters as seen in the episode “Hot Rod Herman”, which may be one of the most memorable episodes from the series. Read on for some more info, and the images, direct from Art Asylum. The Munsters are back! Following up on two successful series of 7-inch action figures based on the classic TV show, Diamond Select Toys has created a third offering of America’s favorite monster family! In the “Hotrod” series, due out in stores this fall, Herman, Grandpa and Lily are back in all-new, episode-specific outfits, with a new family member (Uncle Gilbert) and a new build-an-accessory (the family staircase with Spot), all sculpted by Jean St. Jean! Clocking in at 350 pounds and 7 feet 3 inches tall, Herman Munster was built in 1850 by Dr. Victor Frankenstein, but is nothing like Frankenstein’s monster of legend. A good-natured, soft-spoken funeral home employee, Herman is a World War II veteran, a good husband to his vampire wife Lily and a loving father to his werewolf son Eddie. 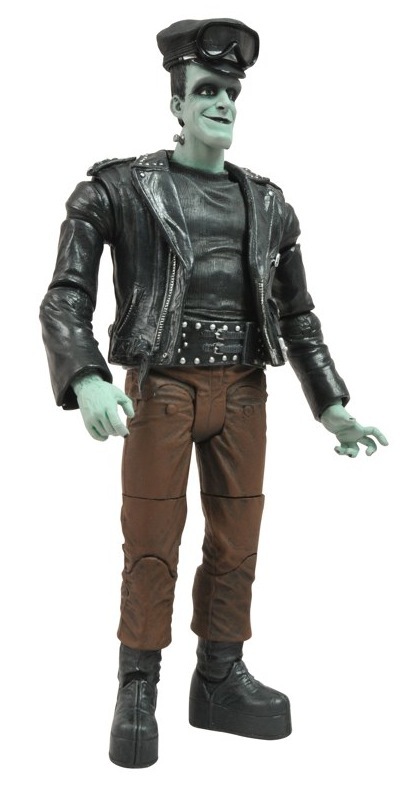 This 7-inch scale figure depicts actor Fred Gwynne as he appeared in the 1965 TV episode “Hot Rod Herman,” when he got mixed up in drag racing and lost the family Koach. 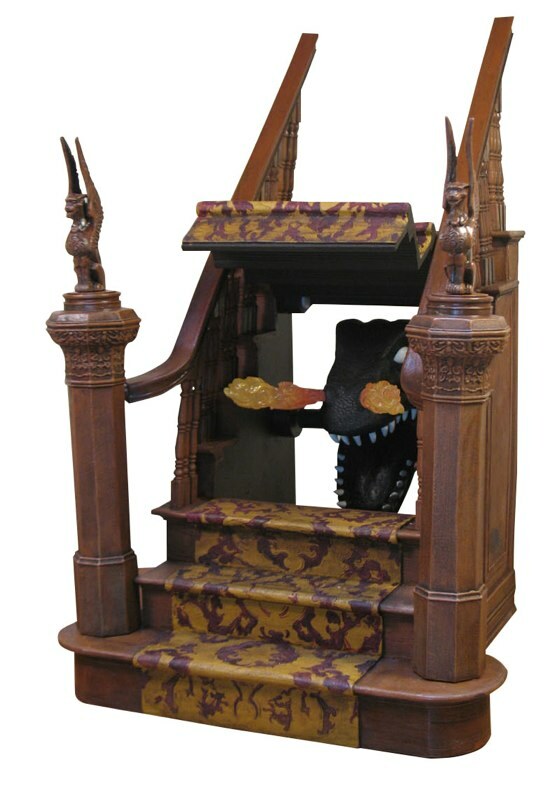 The Select version of Herman includes parts to build the family staircase diorama; the basic figure will also be available at Toys “R” Us. Born Lily Dracula of Transylvania, the matriarch of the Munster family is the daughter of a vampire, but werewolf blood also runs in her family, as both her brother and her son bear the curse. Loving dust and decay, she keeps the Munster household nice and messy, and is also an adoptive mother and confidante to her niece Marilyn. This 7-inch scale figure depicts actress Yvonne DeCarlo as she appeared in the 1965 TV episode “Hot Rod Herman,” complete with parasol. 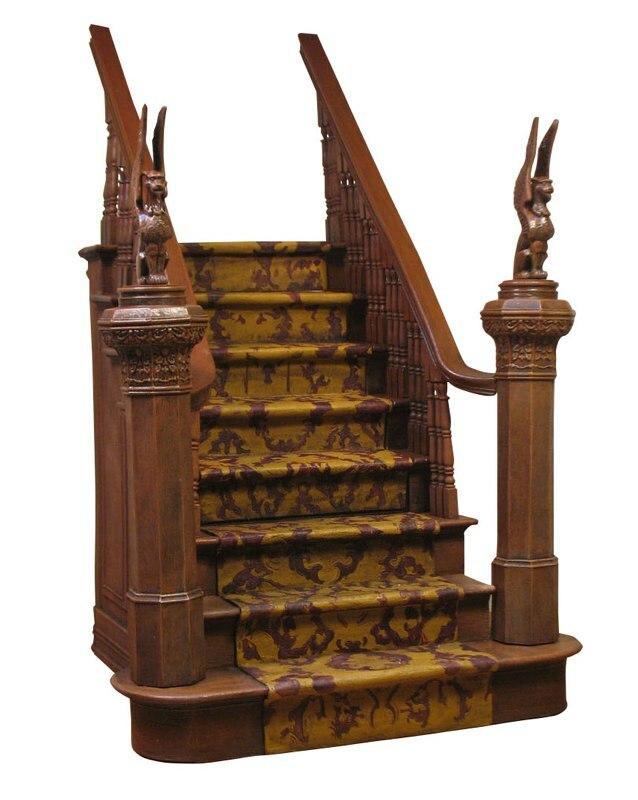 The Select version of Lily includes parts to build the family staircase diorama; the basic figure will also be available at Toys “R” Us. Sam Dracula, the famous Count Dracula of legend, was married 166 times, and even though his wives are all dead, he still keeps in touch. Over 600 years old, he personally knew King Arthur and Jack the Ripper, can still turn into a wolf or a bat (if he takes his pills) and is also a persistent inventor. This 7-inch scale figure depicts actor Al Lewis as he appeared in the 1965 TV episode “Hot Rod Herman,” when he modified his own coffin into a race car in order to win back the family Koach. The Select version of Grandpa includes parts to build the family staircase diorama; the basic figure will also be available at Toys “R” Us. The Munster family has many branches, and one branch is inhabited by Uncle Gilbert, a strange, dapperly dressed undersea creature. A resident of the Black Lagoon, he once asked the family to hold onto 180,000 in Spanish doubloons he had salvaged from various shipwrecks. 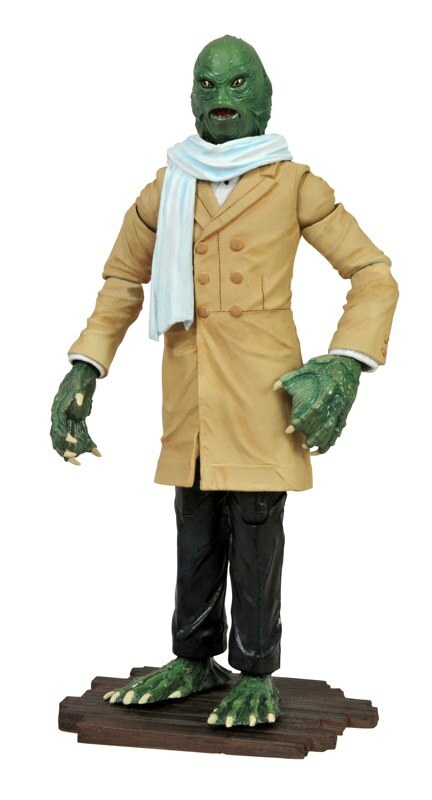 This 7-inch scale figure depicts Gilbert (played by Richard Hale) as he appeared in the 1965 TV episode “Love Comes to Mockingbird Heights.” Uncle Gilbert will only be available as a Previews-exclusive Select figure, and includes parts to build the family staircase diorama. 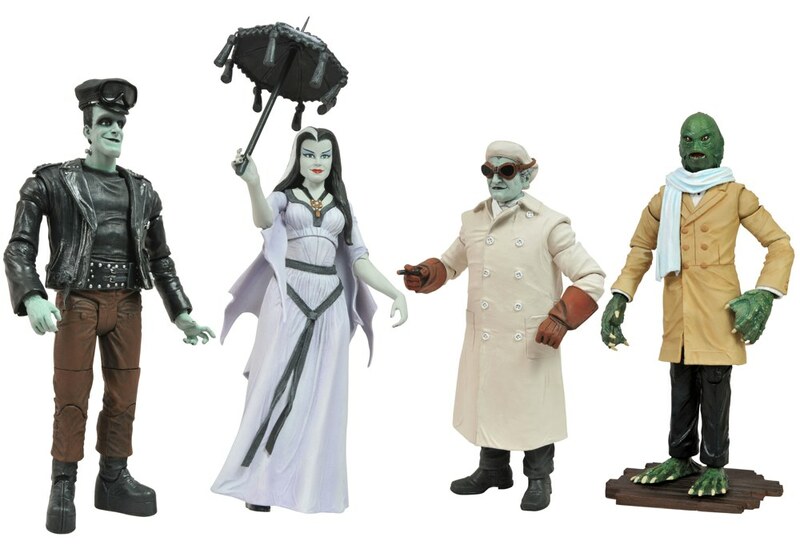 Collect all four specialty-exclusive Select figures to own another part of 1313 Mockingbird Lane! Can we have a show of hands who buys or is even familiar with the Munsters? I bought the first 3 figures: Herman, Lily and Grandpa. Great figures. I loved the show growing up. One of the best theme songs in television history. Wasn't too crazy about the recent attempt at a reboot: Mockingbird Lane. 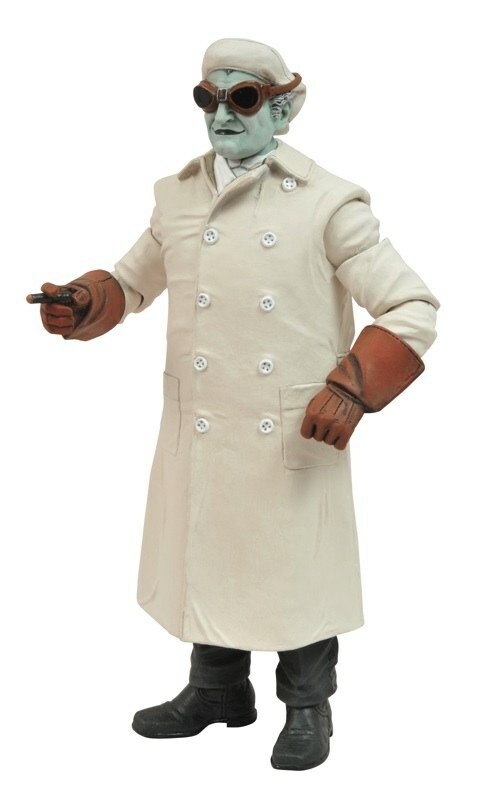 Here's hoping Diamond Select releases a series of Aadams Family figures. Who isn't familiar with the Munsters? I can't wait for these! I am a huge Munsters fan and can't wait to add the staircase to my shelf display. Looks pretty cool, but not something I'd collect. I have been eyeing the Minimates Roach Coach, though. Or not a Rob Zombie fan. Good point, but everyone should atleast check ol Rob out, he is one of the only real rock stars left. By the way, I'm personally very happy that Munsters stuff is still getting made.